On Wednesday, I received a desperate call from an animal rescue friend in Alabama, Kara, who needed my help. Kara had seen a group of sickly, stray dogs at her local bank, and she was determined to help them. So, Kara and another dog rescue friend, Marsha Campbell, spent much of their day trying to catch the pups. 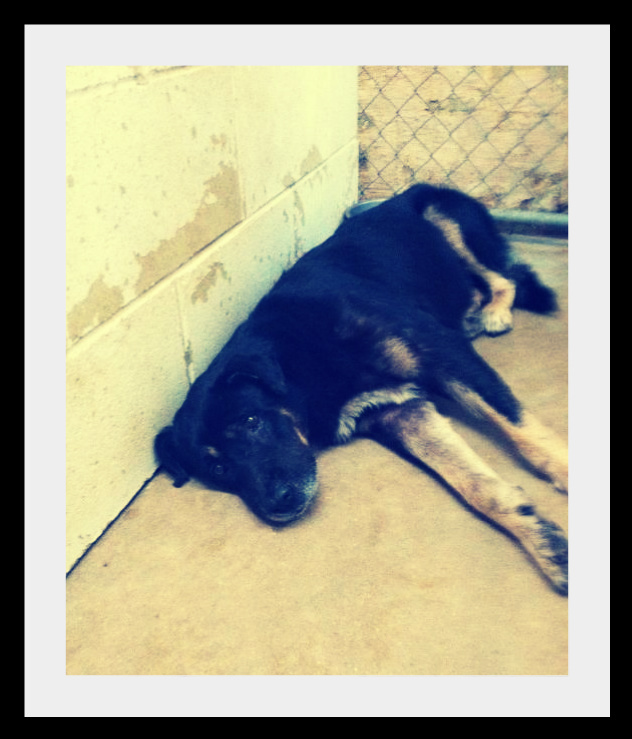 At the very least, they hoped to catch the most injured dog in the group, a senior Rottie/Shepherd mix... with a broken heart. After hours of trying, they finally succeeded. They loaded the older boy into the car and drove straight to the vet. On the way, they named the dog: Lucky. The news wasn't good. The dog was approximately 10 years old, and he was very sick. In addition, he had some older injuries that caused a great deal of pain and distress, including a broken elbow, a broken jawbone, and a lip that's detached from his jaw. The vet continued... giving a grim life expectancy: only 2 years left--max--and probably less, given his condition. And so, euthanasia was recommended. Kara and Marsha were in tears. They asked if they could board the dog for a couple of days, to give them time to find a dog rescue who'd be willing to love this boy in his final years. I'd had an awful day... and I was physically and mentally drained by the time Kara called. Initially, I had my, "I'm so sorry, but I just can't take him" on stand-by, but I was still planning to help Kara find another animal rescue to help. Lucky is a 10 year old dog that has lived his entire life on the streets... begging for food, hoping for water, and searching for shelter. For the last 2 years, he's lived outside of a bank. His elbow was broken... but no one helped him. His jaw was injured... but no one treated him. When he was hungry, thirsty, hot, or cold... no one cared. For 10 years, Lucky has never had a family. For 10 years, he's never had a place to call home. For 10 years, he's been forced to fend for himself. For 10 years, he's never known love. And for 10 years, he's never even had a name. Until now... and it's Lucky. Obviously, the word "lucky" is very special to me. 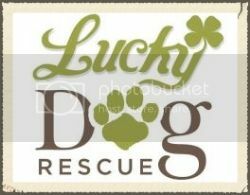 I named my rescue "Lucky Dog Rescue" and my dog kennel business is "Lucky Dog Retreat." In addition, the only other dog I've ever named "Lucky" also suffered from a broken elbow and severe neglect. When I answered Kara's call, I was never planning to take another rescue dog. But as I listened to Lucky's story, I knew... that without me... Lucky would die, in a vet's office, without ever knowing what it was like to belong to someone. Kara was sobbing, asking if I knew of anyone that would be willing to help him. Tears were streaming down my face... as I searched for the right answer. Then, I heard myself say, "Can you get him to Meridian?" 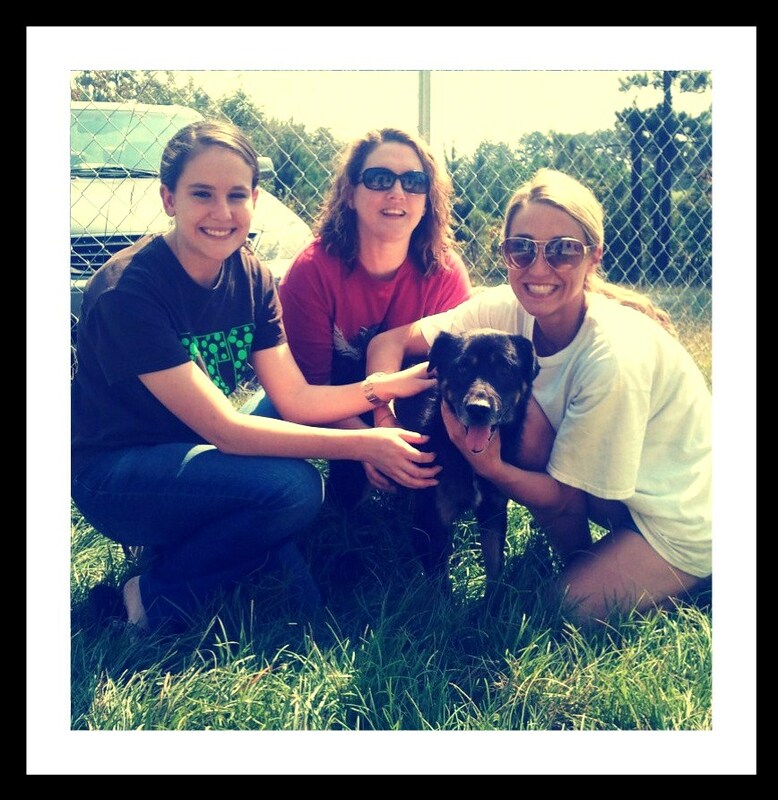 Today, Kara and Marsha drove 3 hours to get Lucky to his new mom-- me. He'll live with me for the rest of his life, however long that may be. When Lucky arrived at Lucky Dog Rescue, he scanned his surroundings... and the big smile that crossed his face said, "It's good to finally be home." *Annie, this one's for you. I love you. that is such a story!!! I have tears running down my face trying to type this, cloudy eyes. Lucky is a handsome boy. I am so happy you have him, hope he lives for a very long time. You are a good person. May God bless and keep you safe all of your days. as always, Ashley cames thru, what an ambassador to all the poor souls out there. You have an amazing heart for giving Lucky a Happy ending to his life that Lucky would never have know with out you! You make my heart smile!! Give Lucky and extra hug and kiss for me!! God Bless!!! Oh Lordy. Tears are streaming down my face too, but it's been an emotional day in general. Would've happened anyway, cuz I'm such a softie where animals are concerned. Bless you, Ashley, for doing this. 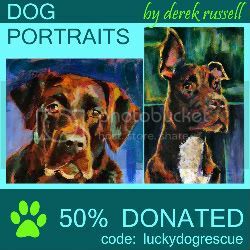 I can't manage to send any $$ this month - we donated to the current FB Canine Cancer fight - but if we have any extra next month, I'll send it along. My main FB acct is still frozen, so I haven't been able to commment like I usually do on all your posts. 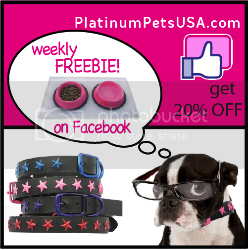 I'll try to remember to come HERE to comment till I'm "free" on FB! I am in tears ...God Bless You! Stories like this is what makes it all worthwhile. Bless you for giving Lucky a place to call home. Admiration from Nova Scotia for all that you do for the dogs. You are truly an inspiration. Lucky, enjoy our new home with our dear friend Ashley. Ashley, I truly love the person that you are. Hugs to you both, and your other 'kids' too! You are amazing! Lucky is blessed to have found you, and you make more then just Lucky's life better by the work you do and the heart you have. Thank you. Please share more of Lucky's story as he settles in to his loving home. I TOO AM CRYING FOR LUCKY'S PAST SADNESS ,AND FOR HIS GOOD LUCK AT YOUR FINDING HIM,GOD HAS BLESSED YOU BOTH. You are an Angel from heaven for what you do!! This story touched my heart and tears were coming!! I'm so happy for Lucky to live his life out in a loving home!! God bless !! I have tears in my eyes also, I love animals so much, bless you for taking him in. You are wonderful. What a lucky dog indead. And what a lucky human to be able to show this dog some love. He'll probably live out his days knowing exactly why he had to wait ten years for his forever home, because he needed to be with you Ashley! Thanks for giving me the opportunity to have a good cry. What a wonderful story - this brought tears to my eyes as well. So sad that most of his life he has never had someone to love him but now he will be forever loved. Dogs love us no matter what they have been thru. May God bless you and Lucky! Now he will know what love is! You are AWESOME! You are such an angel!!!! Great Story, I cried too! You are an angel to Lucky! Glad he will finally in his last years know what it is to have a home & family. Thank you for all you do, to help all the animals in the world! I'm so glad that Lucky got such a wonderful home to live out the remainder of his years ,i say years because now he has the will & the want to live because Lucky now has something he's never had in his doggie life "a home &a family he can call his own",now he will know what it feels like to be loved &to be wanted by a family such as yours.GOD BLESS YOU&YOUR NEW FOUND FRIEND LUCKY. They say angels only exist in fairy tales, but after reading this post i'm not sure any longer. Lucky is gonna be a happy dog now! What a beautiful story to share! All animals should be given the chance to experience being loved. I'm thankful there are individuals in this world to see to it that it gets done. So glad Lucky found you and finally knows what it's like to be loved. Blessings on you Ashley as once again you have accomplished what most of us cannot.I wish for you endless energy, endless support, endless supplies, and endless love. You are a miracle. I needed this story today as I've been signing so many animal petitions and feeling beyond frustrated that animals are still treated so poorly. It breaks my heart to know the life this dog has had to have but it makes me so happy to know that one more animal will know what it's like to be loved....finally. Oh my, this one brought me to tears. Thank you so much for your enormous heart Ashley!!! You are truly an angel. A godsend for animals. God bless you in all your efforts to help those who cannot help themselves! I am trying not to sob my heart out, unsuccessfully! Lucky is truly one lucky dog that he found his angel to protect him and love him the rest of his days. Thank you Ashley for having the huge heart you do and doing all you can! Wonderful story, thank you for sharing! Bless you Ashley for all you do, not just for Lucky. I'm so happy that he will know love for whatever time he has left and he might surprise you. Years ago I took in a Newfoundland named Bruno. He'd been used for target practice and was terrified of guns - his backside was peppered with buckshot. He'd been tied to a doghouse on a 6 foot chain and barely fed. He had every worm going except fortunately for heart worm. He had hip dysplasia and was loaded with fleas and ticks - was malnourished. The vet said euthanize him. At the time he was 8 months old. I said no way and he died when he was 14 when his back legs finally actually gave out and I had to put him down - but at least he died in my arms. Miracles do happen. I will have to say..Your heart is in the Right Place when it come to K9's..Even though I'm not a friend..What You do for the K9's~~You do it because You feel their pain and you care for them when no one else will..:)..
Ashley, you make Annie proud!!!!! I commented on your personal story of your car accident in the past because I to, was in one so horrible when I was younger & it still affects me today (phsically, crushed vertebrae & fractured knees). Although I'm not able to help financially right now, I do plan on it in the future. I am an animal lover, horses have always been my passion,but I have always loved dogs & birds as well & I encourage everyone to adopt from a rescue or a shelter.I have been blessed over the yrs with 2 Dalmatians (one I had for 12yrs & one I have had now for 5yrs) My husband has wanted a Boxer pup for 11yrs & I pushed for him to adopt, luckily 2yrs ago a 7month old pup was given to us by a childhood friend that he rescued from a coworker who "wanted a playmate for her boston terrier" both were purchased at a pet store. I named her Roxy, she was extremely emaciated,dehydrated, had no manners & was'nt housebroken. Seeing all the hard work we've both put into her & seeing the great,well adjusted dog she is over 2 yrs w/us today is both rewarding & touching. I also have a recue bird who is the love of my life 5yrs later, but had been abused in his previous home& was so angry & you could'nt even pick him up. I read your stories Ashley & I just love all of them. You are an inspiring person & I wish there were more people who would adopt because animals who have a bad life before, are all the better when they are shown love, guidence & given stability. I have seen it with my own rescues, though I don't run a business, they are a part of my family & will be with me all their days. Keep up the great work you do. Jennie in Marysville, Wa. fighting back the tears... the world would be a much better place with more people like you. best wishes for you and lucky. he is one handsome boy! You are wonderful!! May God bless you always! I lnow Lucky is so happy to be home with you!!!! :) I can never express how wonderful you are! thank you! Yay for Lucky! and Yay for you! I've been homeless in London and NYC. In London, while going to college, I lived in an abandoned building for nearly (3) years; and in NYC a friend took me in (even though I had drug and alcohol problems) and let me live with her for (2) weeks until I found a safe place to move to. A few years later, I smashed my wrist snowboarding. My wrist had come out of it's socket and was smashed in several places; and the clinic on the mountain wouldn't set it without me coming up with the $200.00 necessary, on the spot. My so called friends didn't help (they carried on boarding) and family members couldn't or wouldn't come to my aid. In desperation, I reached out to a co-worker who took pity on me and gave me her credit card info (I couldn't believe it) She later found me a wrist and hand surgeon who agreed to pin and screw my wrist back together at a discounted rate. Why am I telling you all this ? Because I know some of what Lucky's lived through and the unbelievable kindness, uncompromising love and service of these two women in my life, showed me that there are trustworthy humans who won't use and/or abuse me - just like you've given this gift to Lucky. I've never forgotten what Molly and Elyse did for me; and believe me, Lucky will never forget you. 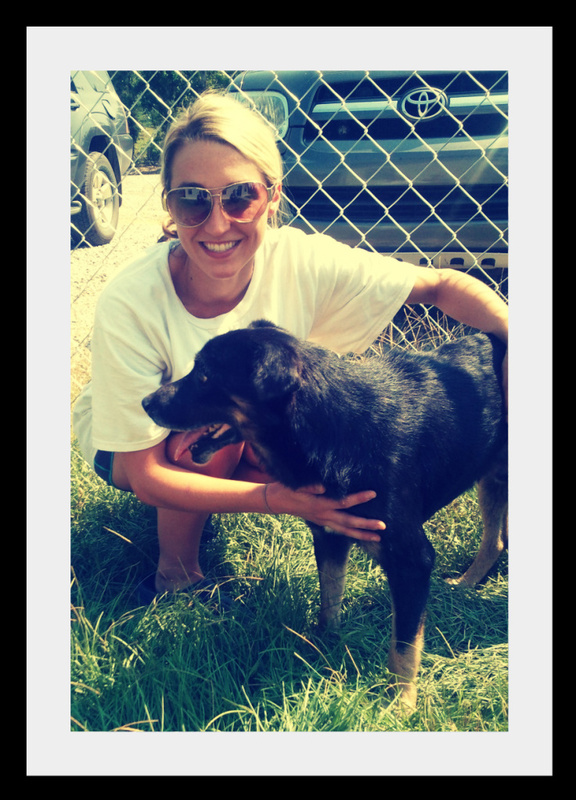 Thank you Ashley for taking on Lucky - I already know he's going to be a huge gift to you and your mission. YAY KARA, MARSHA, ASHLEY AND LUCKY!!! SENT A DONATION ASHLEY, JUST TO DO A LITTLE TO SUPPORT YOUR AWESOME WORK! I am so happy for this dog, and I hope the vet is wrong. He needs more than two years to enjoy his new happy life!! All I can think to say is God Bless Lucky,and I know God will bless YOU!!! Ashley, you are such a wonderful person. Every time I read your blog I am in tears. You touch my heart. I hope someday to meet you or have the privilege to adopt one of your precious dogs. I hope someday I will have that opportunity. You have made me want to do more to help shelters in need. My eyes have been opened to the tragedy of the kill shelter and I can't just shut my eyes now. My heart breaks for each and every life lost. I don't know how you deal with the heartache. Know that you are making a difference and I hope someday soon I will have the means to support your quest. I am sobbing!! What an amazing and heart warming story!!! You are truly a wonderful person!!! May Lucky remind you everyday that your love and a real home is everything!!! I would love to help....It breaks my heart every day to see so many wonderful animals suffer and be thrown away like they were garbage. God bless you!!! You are a hero!!! I love that last picture. If you look, you can just see how bright and shining his eyes are and how overwhelmed and happy he *that someone cares*. he is so lucky to have you Ashley. Ashley you are a God sent for Lucky.Is been an emotional day for me,your story made me cry and then smile at the end.Thank you so much for giving Lucky a chance for happiness and knowing the love and safety. My heart broke with the misery this poor dog suffered till he was "Lucky" enough to meet people like you and your friends. Im glad he will have a loving home till his time on this cruel earth has ended. Thanks for being the person you are and keep on caring for those that have been forgotten. So very glad that you were able to help Lucky. What a beautiful boy. It horrifies me that he lived as he did, for so long, while people just stood by and watched or walked away :-( Thank goodness for the decent people who got involved and helped him. Now he can let go of the past and enjoy the best retirement ever, with you. Another lucky dog, another wonderful dog, and another selfless act. As a writer you do the nearly impossible, you write about yourself, as the hero of the story, who does something wonderful, and you still come off as humble and unassuming. Putting aside your wonderful work with dogs, as a writer, that shows great skill. You are able to stay neutral while writing about yourself as a character. Once you save every single dog in the world, you can then become the writer you are destined to be. "Don't know you but I want to hug you for being there for LUCKY"
Ashley... you have a big heart! Thank you for giving Lucky a home for his remaining years. I'm so glad someone found this dog and showed him love. THANK YOU, ASHLEY, FOR ALL YOU DO!! BLESS HIS HEART AND BLESS YOU! !..TEARS ARE FALLING DOWN MY FACE RIGHT NOW..FOR SAD REASONS, THE TEN YEARS LUCKY NEVER KNEW LOVE, AND FOR THE HAPPINESS THAT HE FINALLY HAS A LOVING FUREVER HOME WITH YOU! TEARS FOR ALL THE BEAUTIFUL FURRY LITTLE ANGELS ALL OVER THE WORLD!!! You rock! Really, you are like, my favorite person! Thabks for all you do and for showing poor, abandoned and neglected Lucky what it's like to finally be loved.